Amazon FreeRTOS Curiosity PIC32MZ EF Bundle is used to develop Amazon FreeRTOS-based applications. 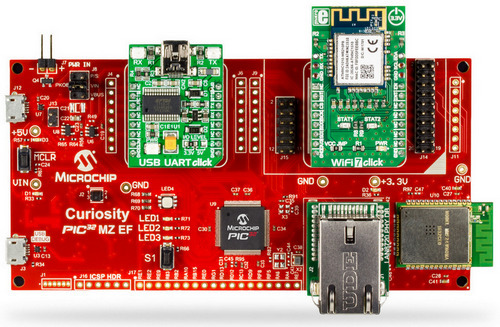 The bundle consists of Curiosity PIC32MZ EF development board, WiFi 7 Click Board & USB UART Click Board that can be used to develop an AWS cloud-connected applications. The bundle also includes the LAN8720A PHY Daughter Board to create an Ethernet-connected demo. The high-performance PIC32MZ EF MCUs host the Amazon FreeRTOS and run at up to 415 DMIPs with industry-leading connectivity options including 10/100 Ethernet MAC, Hi-Speed USB & Dual CAN, ample Flash memory of up to 2 MB, rich peripherals and a robust tool chain which empower embedded designers to rapidly build complex applications. Target USB connector for PIC32 USB connectivity (Device/Host mode). Header for external 5V input . Three user LEDs , One RGB LED. One User and Reset Button.